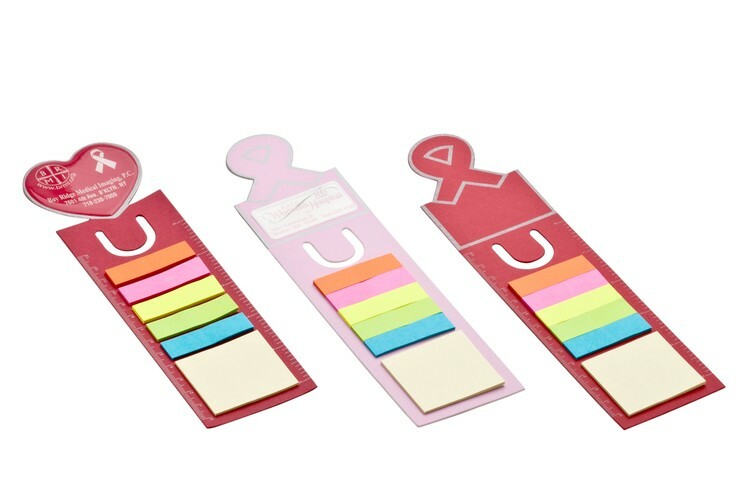 Liqui-Mark Correction Tapes are an easy, no-mess way to make quick, neat corrections to your important documents. 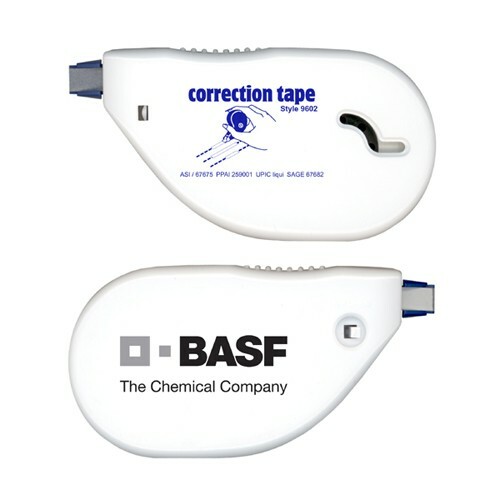 Correction Tape fits easily in your hand and makes no fuss corrections with clean, opaque coverage. 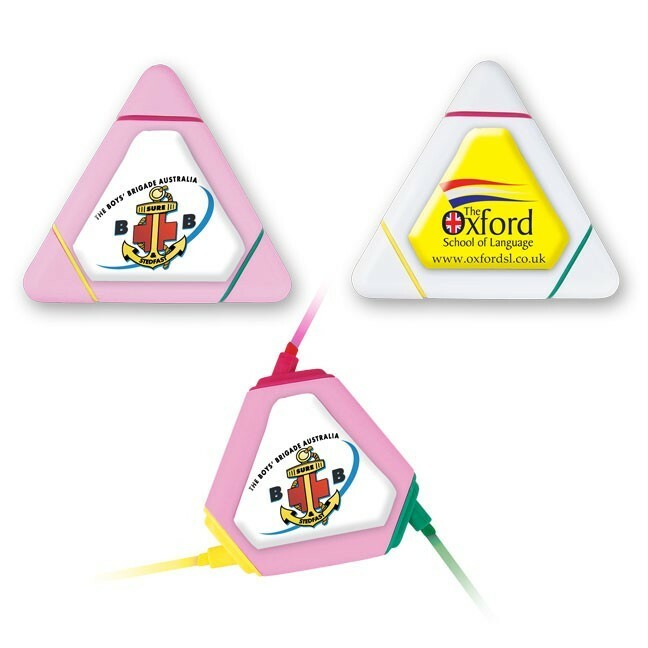 The tape dispenser can be rotated for left or right handed use!. 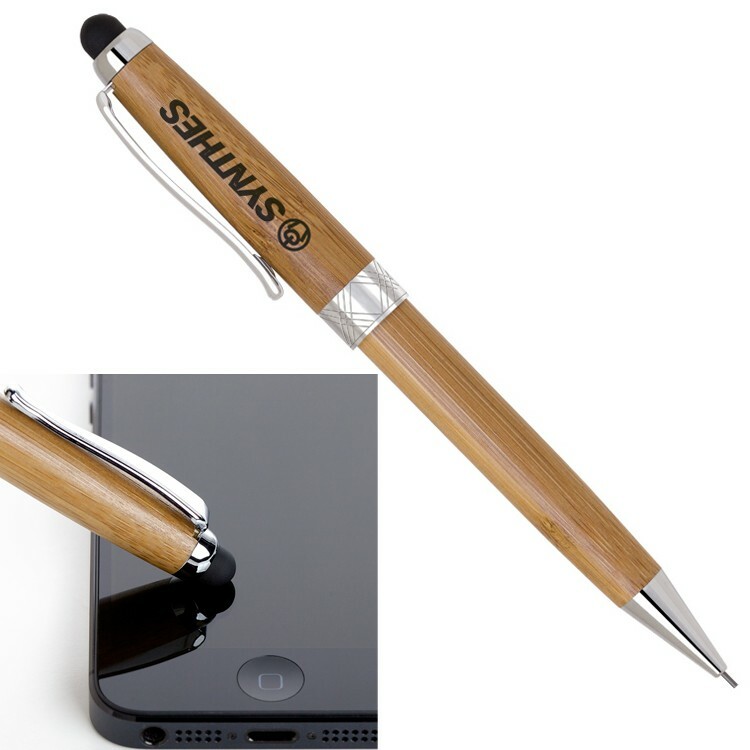 Eco II Stylus Tool with Bamboo Mechanical Pencil Eco-Friendly - Green Product Bamboo Made Pencil with Chrome Accents 2-in-1 Mechanical Pencil Stylus Function design includes a capacitive soft touch stylus fully compatible with iPad, iPhone, iTouch, and all other touch screens Packed in a Free Gift Box ( No Imprint ) Imprint on Gift Box Add $0.25 (v) plus Setup Matching Pen - KP337 Pen / Pencil Setup KP341 Price includes one color/ position Silk Screen, Pad Print or Laser Engraving Additional Silkscreen Position and/or Color Running Charge: $0.25 (v) Additional Laser Engraving Position Running Charge: $0.35 (v) Comes in Bamboo with Satin Chrome Each Stylus Comes in Gift Box Imprint Area: Silkscreen: 1” H x 1-1/8” W (Cap) 1-1/8” H x 1-3/8” W (Barrel) Pad Imprint: 5/16” H x 1-1/8” W (Cap) 5/16” H x 1-3/8” W (Barrel) Engraving: 5/16” h x 1-1/8” w (Cap) 5/16” H x 1-3/8” W (Barrel) FOB: 92821 500 pcs / 36 lbs. 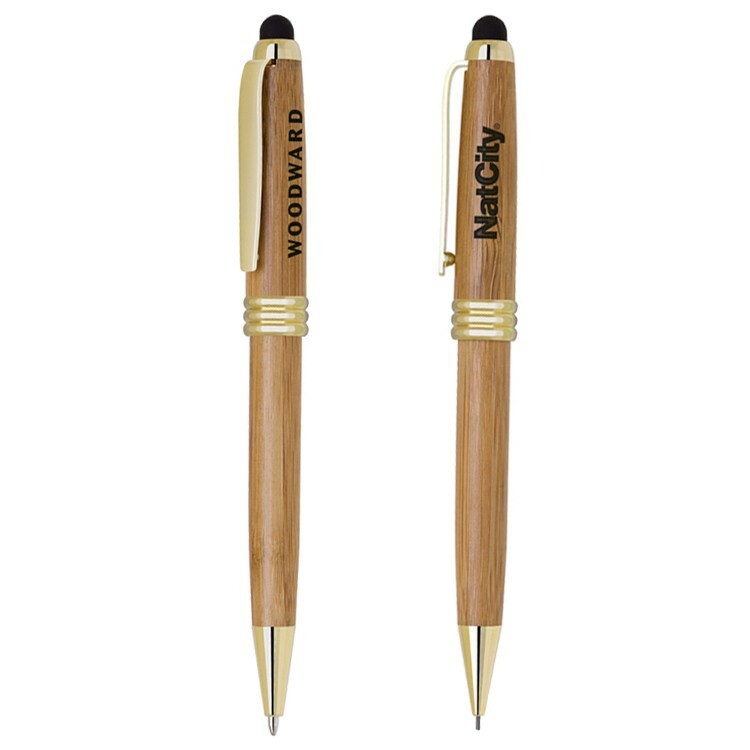 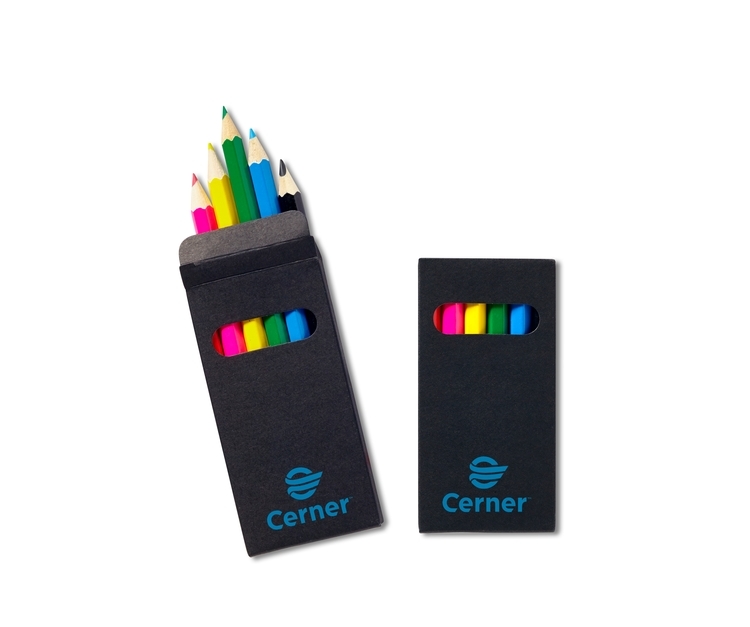 This incredible promotional value is now available with a sleek black box and six genuine colorful mini wooden pre-sharpened pencils with matching writing color! 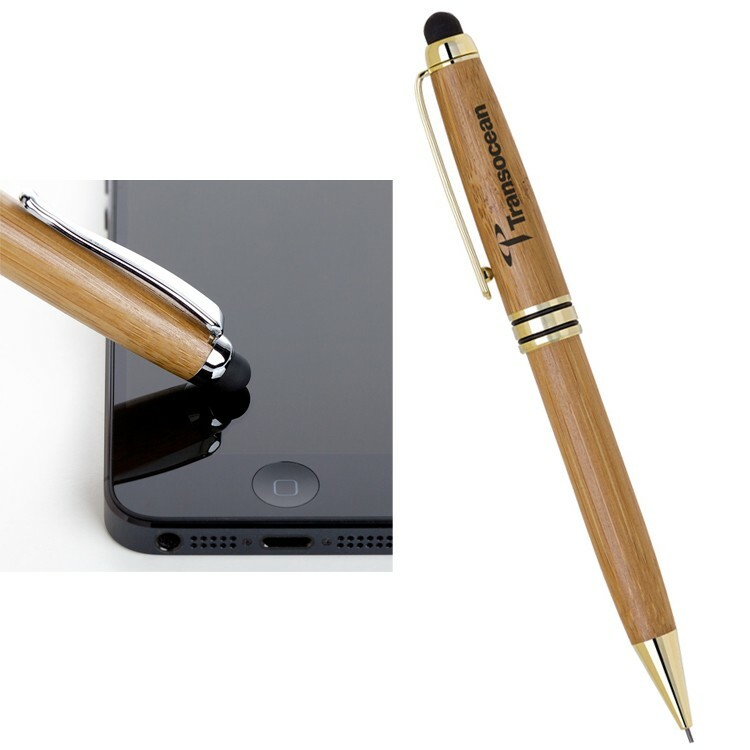 Eco VI Stylus Tool with Bamboo Mechanical Pencil Eco-Friendly - Green Product Bamboo Made Pencil with Gold Accents Mechanical Pencil 2-in-1 Ballpoint Stylus Function design includes a capacitive soft touch stylus fully compatible with iPad, iPhone, iTouch, and all other touch screens Packed in a Free Gift Box ( No Imprint ) Imprint on Gift Box Add $0.25 (v) plus Setup Matching Pen - KP341 Pen / Pencil Setup KP345 Price includes one color/ position Silk Screen, Pad Print, Laser Engraving Additional Silkscreen Position and/or Color Running Charge: $0.25 (v) Additional Laser Engraving Position Running Charge: $0.35 (v) Comes in Bamboo with Gold Each Stylus Comes in Gift Box Imprint Area: Silkscreen: 1” H x 1-1/8” W (Cap) 1-1/8” H x 1-3/8” W (Barrel) Pad Imprint: 5/16” H x 1-1/8” W (Cap) 5/16” H x 1-3/8” W (Barrel) Engraving: 5/16” h x 1-1/8” w (Cap) 5/16” H x 1-3/8” W (Barrel) FOB: 92821 500 pcs / 36 lbs. 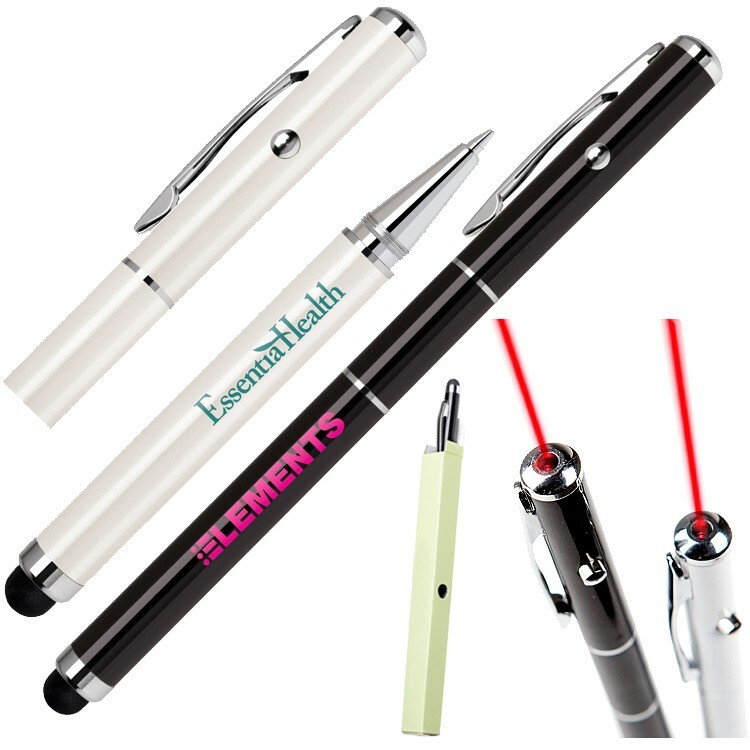 Blair Stylus / Laser Pointer / Pen Combo 3 in 1 multifunctional Stylus and Laser Pointer and Ballpoint Pen Brass constructed body Twist-off upper body contains Laser Pointer while lower body contains Ballpoint Pen Tri function design includes a capacitive soft touch stylus fully compatible with iPad, iPhone, iTouch, and all other touch screens Packed in a Free Gift Box ( No Imprint ) Imprint on Gift Box Add $0.25 (v) plus Setup Price includes one color/ position laser engrave or silk screen Laser engraved in gold Oxidation black & laser chrome are available with additional charge $0.25(v) Comes in Glisten Black, Pearl White Each pen Stylus Combo comes in Gift Box Black ink standard. 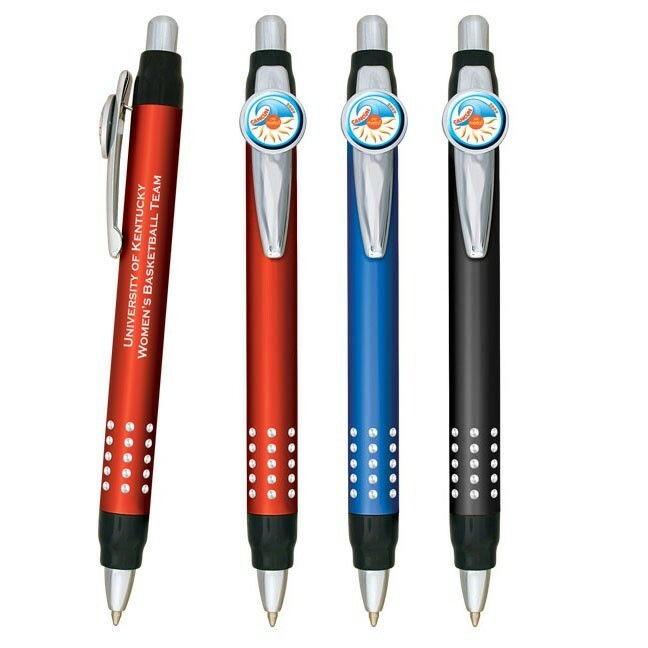 Switch to Blue Ink add $0.10(v) Oxidation black & laser chrome are available with additional charge $0.25(v) Additional Silkscreen Position and/or Color Imprint Running Charge: $0.25 (v) Additional Laser Engraving Position Running Charge: $0.35 (v) Imprint Area: Silkscreen: 1” H x 2” W (Lower Barrel) 1” H x 11/16” W (Middle Barrel) 1/2"H x 1-1/2” W (Cap) Engraving: 5/16” H x 2” W (Lower Barrel) 5/16” H x 11/16” W (Middle Barrel) 5/16"H x 1-1/2” W (Cap) FOB: 92821 500 pcs / 23 lbs. 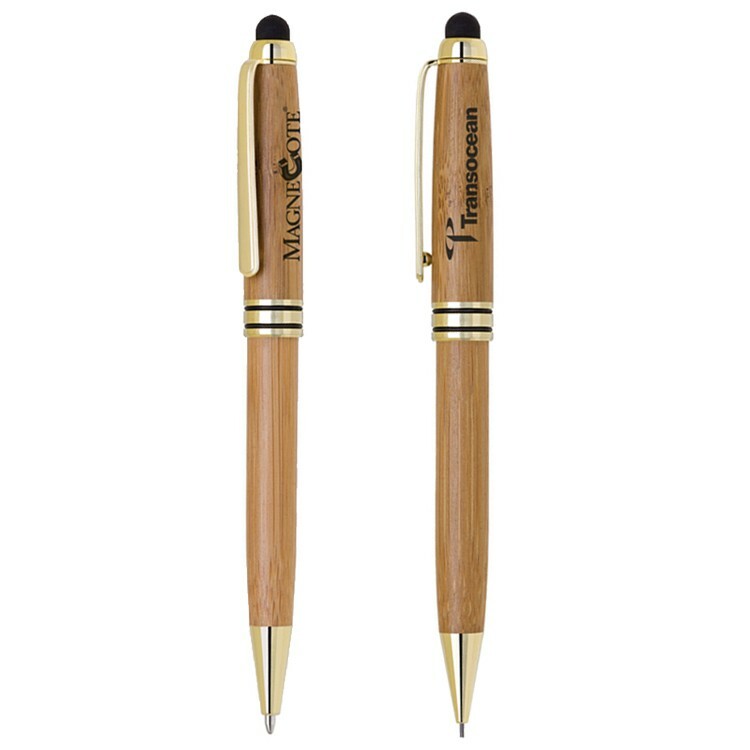 Eco III Stylus Tool with Bamboo Ballpoint Pen Eco-Friendly - Green Product Bamboo Made Pen with Gold Accents Twist Action Pen 2-in-1 Ballpoint Stylus Function design includes a capacitive soft touch stylus fully compatible with iPad, iPhone, iTouch, and all other touch screens Packed in a Free Gift Box ( No Imprint ) Imprint on Gift Box Add $0.25 (v) plus Setup Matching Pencil - KP340 Pen / Pencil Setup KP342 Price includes one color/ position Silk Screen, Pad Print or Laser Engraving Additional Silkscreen Position and/or Color Running Charge: $0.25 (v) Additional Laser Engraving Position Running Charge: $0.35 (v) $0.20(v) to upgrade from ballpoint to Gel Ink, available in Black or Blue ink Comes in Bamboo with Gold Each Stylus Comes in Gift Box Imprint Area: Silkscreen: 1” H x 1-1/8” W (Cap) 1-1/8” H x 1-3/8” W (Barrel) Pad Imprint: 5/16” H x 1-1/8” W (Cap) 5/16” H x 1-3/8” W (Barrel) Engraving: 5/16” h x 1-1/8” w (Cap) 5/16” H x 1-3/8” W (Barrel) FOB: 92821 500 pcs / 32 lbs. 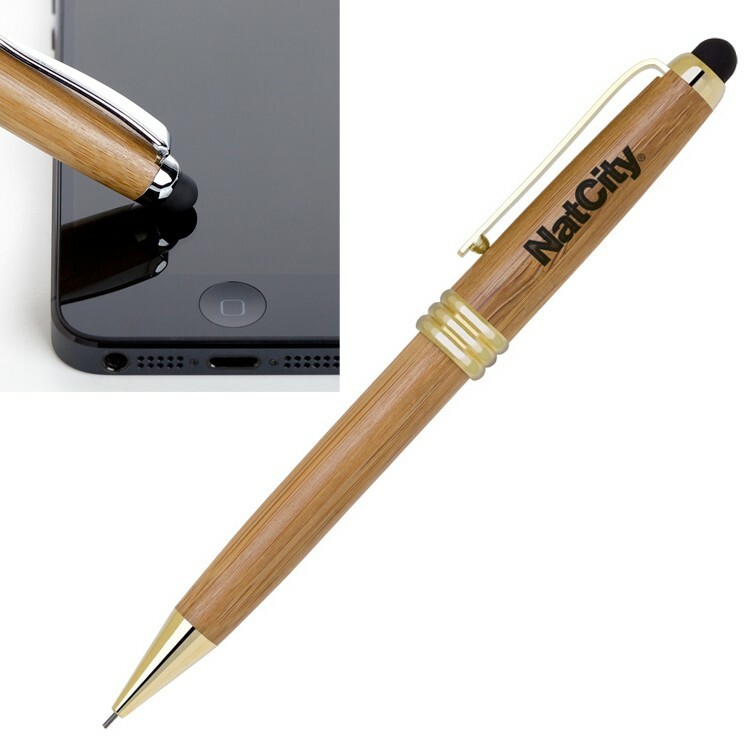 Eco II Stylus Tool with Bamboo Mechanical Pencil Eco-Friendly - Green Product Bamboo Made Pencil with Gold Accents 2-in-1 Mechanical Pencil Stylus Function design includes a capacitive soft touch stylus fully compatible with iPad, iPhone, iTouch, and all other touch screens Packed in a Free Gift Box ( No Imprint ) Imprint on Gift Box Add $0.25 (v) plus Setup Matching Pen - KP339 Pen / Pencil Setup KP342 Price includes one color/ position Silk Screen, Pad Print or Laser Engraving Additional Silkscreen Position and/or Color Running Charge: $0.25 (v) Additional Laser Engraving Position Running Charge: $0.35 (v) Comes in Bamboo with Gold Each Stylus Comes in Gift Box Imprint Area: Silkscreen: 1” H x 1-1/8” W (Cap) 1-1/8” H x 1-3/8” W (Barrel) Pad Imprint: 5/16” H x 1-1/8” W (Cap) 5/16” H x 1-3/8” W (Barrel) Engraving: 5/16” h x 1-1/8” w (Cap) 5/16” H x 1-3/8” W (Barrel) FOB: 92821 500 pcs / 36 lbs. 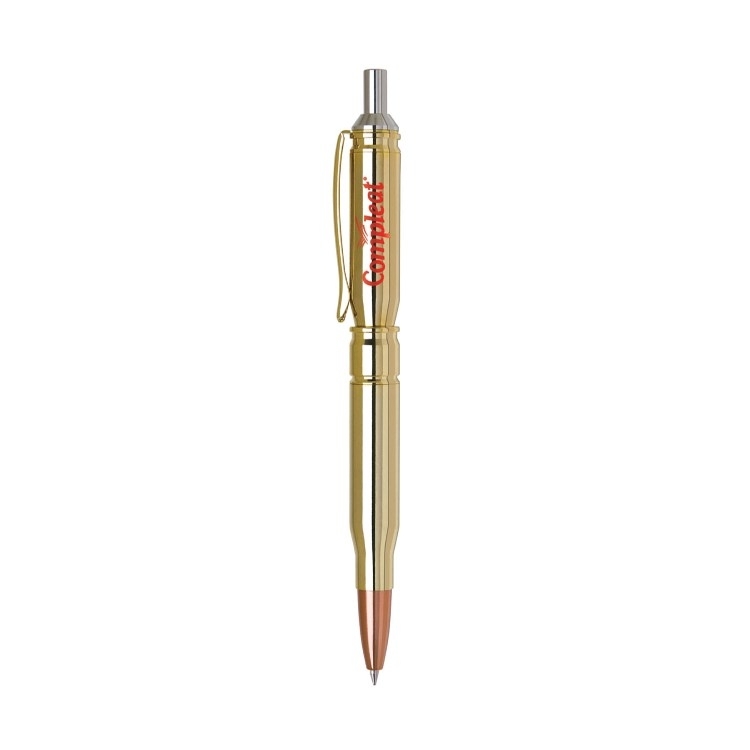 1/31/3Solid brass construction 1/31/3Click action mechanism ballpoint 1/31/3Polished gold plate finish with copper color points Blue ink refill Optional. 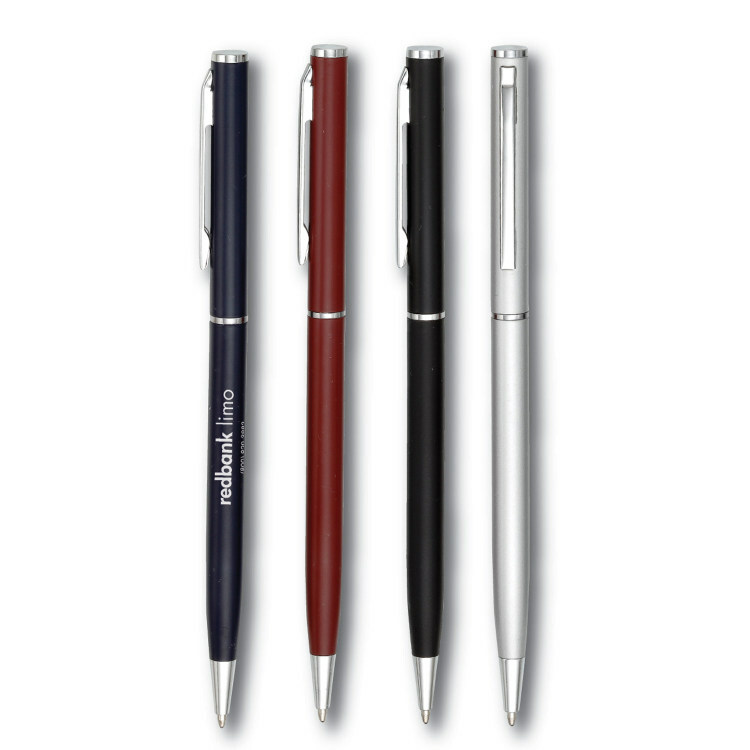 Refills contain NON-TOXIC INK! 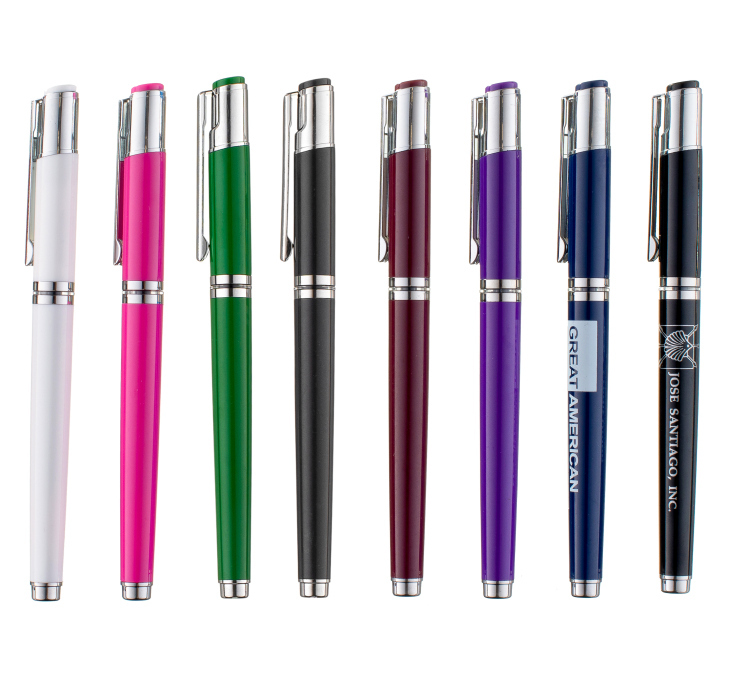 The classic and popular Slimster pen now comes with a twist! 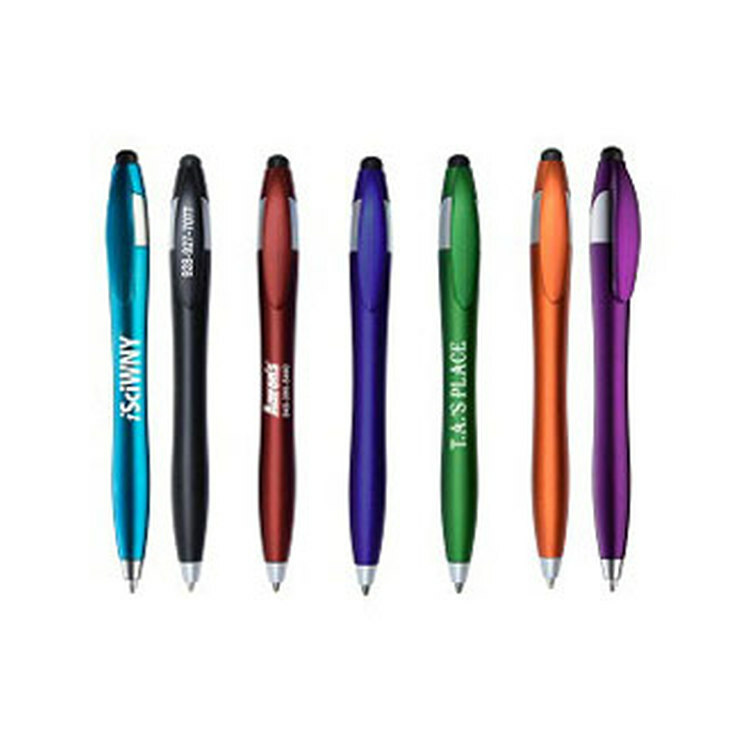 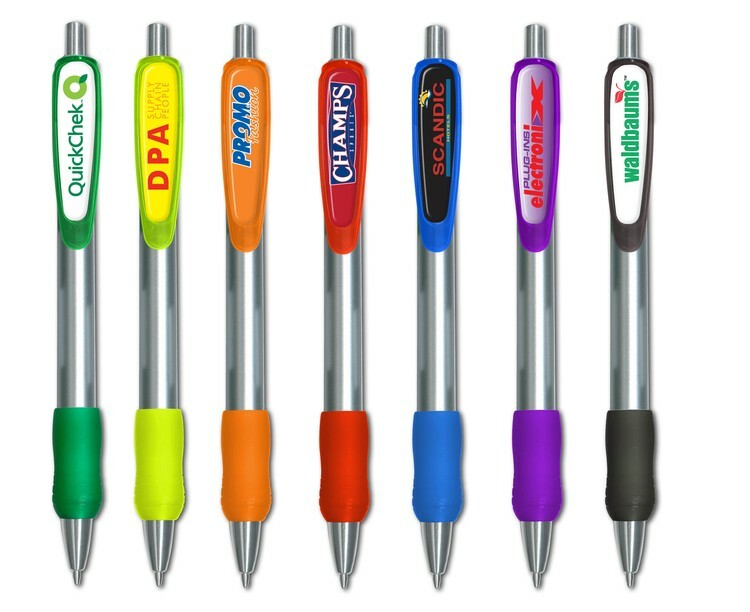 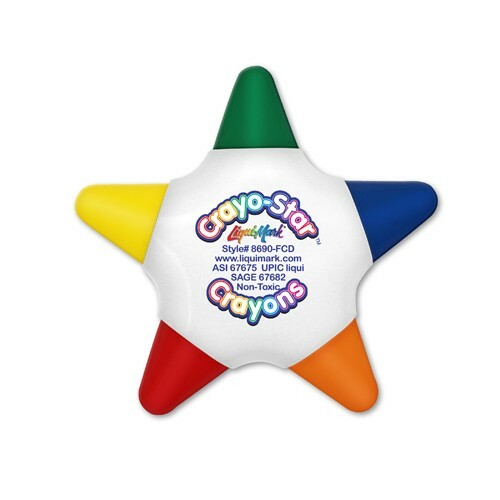 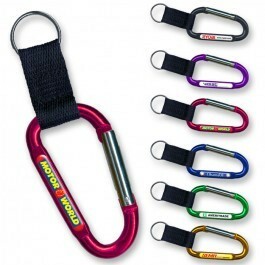 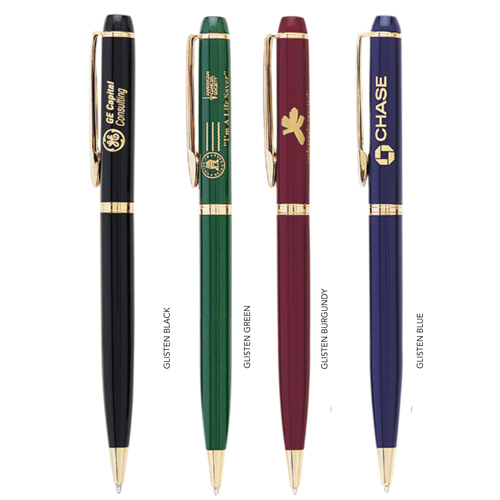 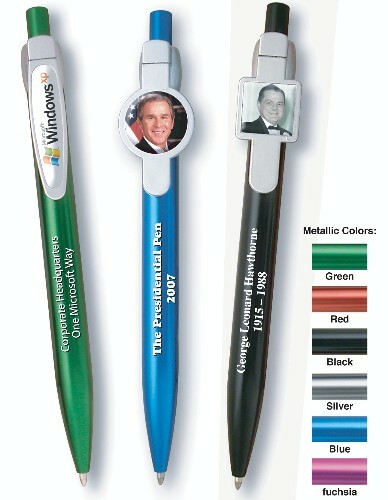 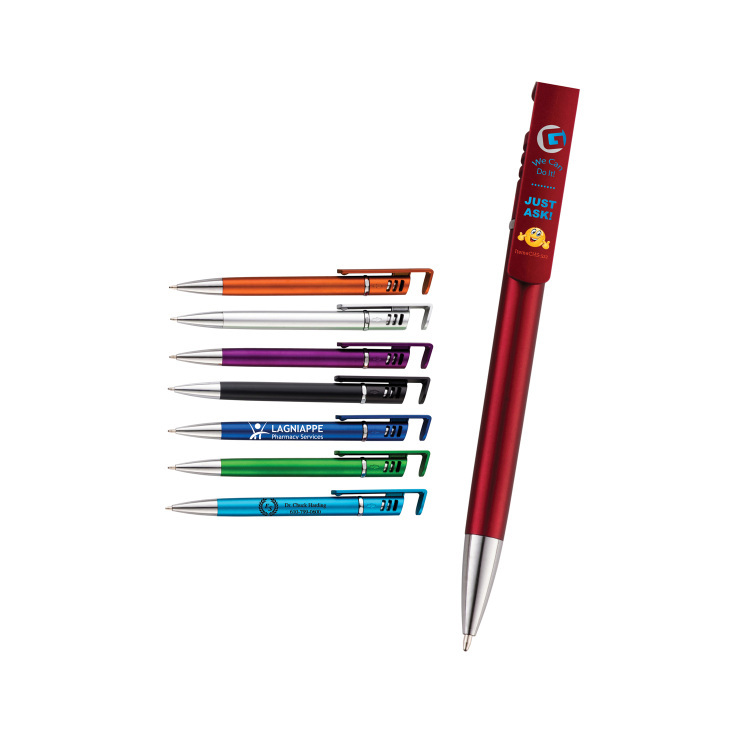 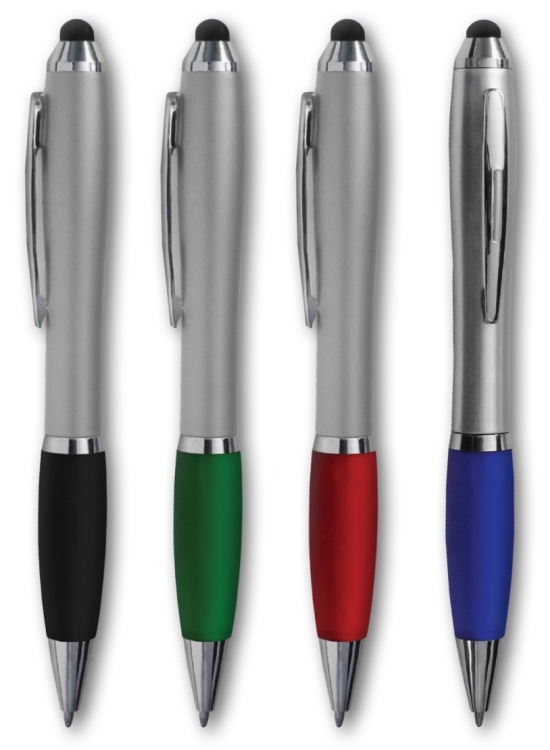 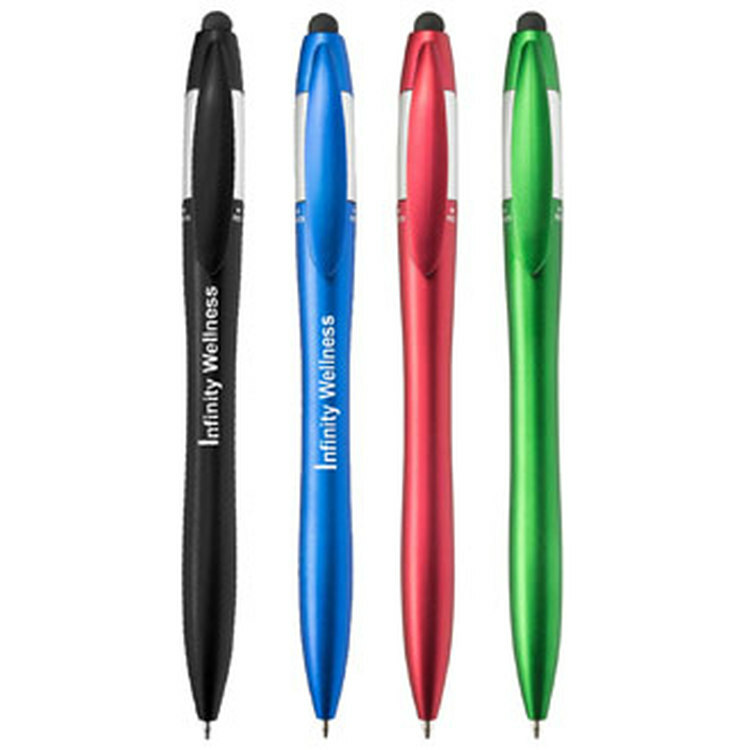 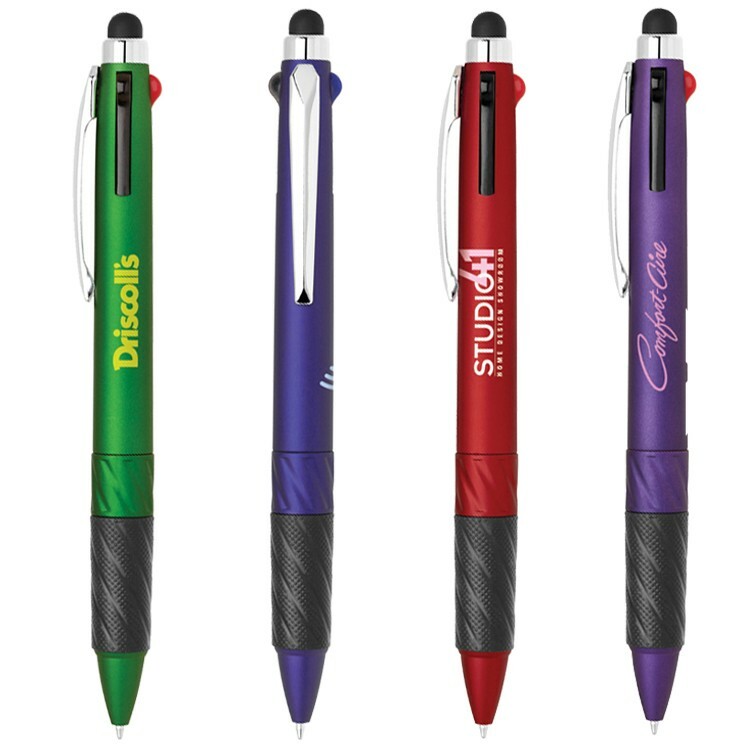 With a choice of seven vibrant colors and a metallic finish this stylus pen is a favorite. 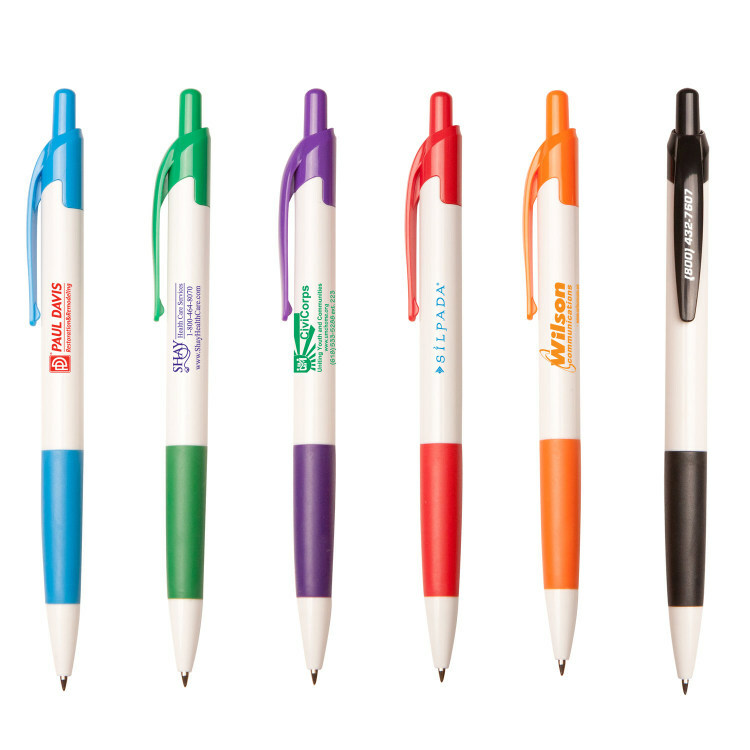 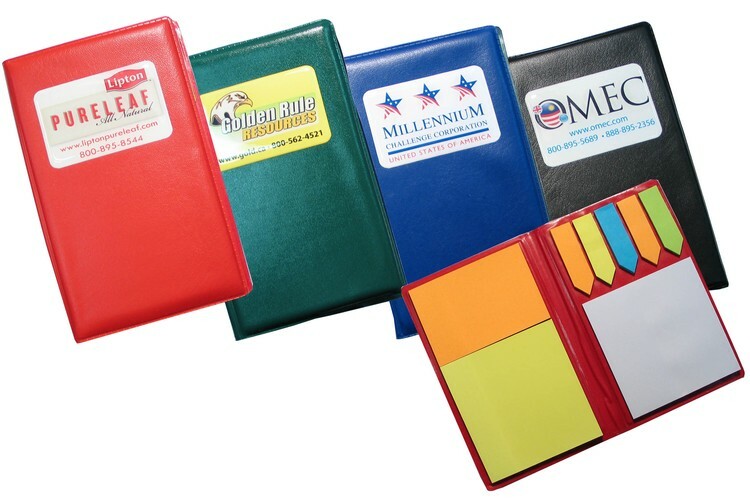 * USA Made * Our dry erase markers work great on white board, glass and any other non-porous surface. 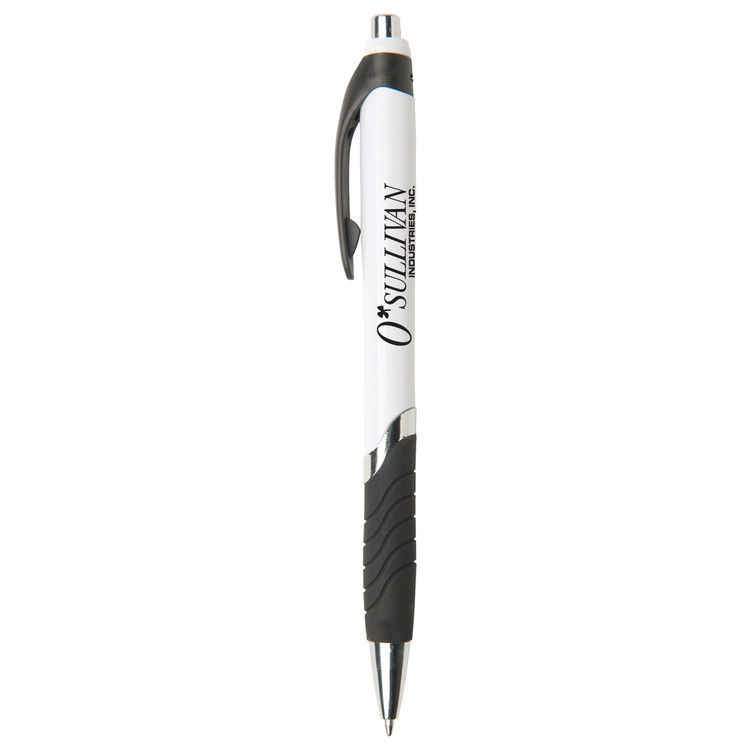 The ink is easily removed with a dry cloth, tissue or eraser. 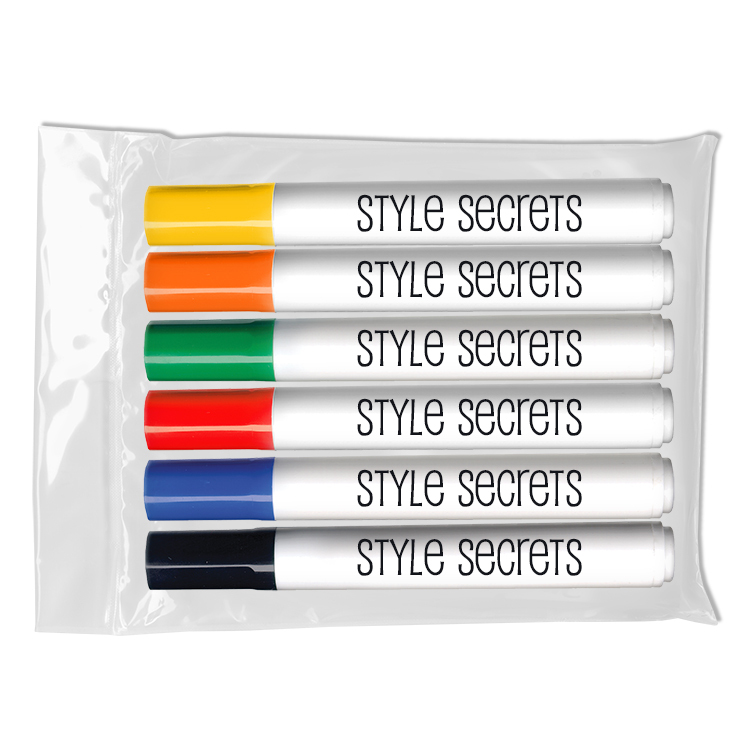 Low odor, non-toxic, dry erase inks will not irritate your eyes or nose.